We have been Hyundai dealers for over 20 years, and in that time we have seen the Hyundai range of products change considerably, culminating in a reliable and innovative product line featuring tracked excavators, wheeled loaders, mini and midi excavators and skid steer loaders. With new styling, refined cab interiors and more powerful, the Hyundai range is a force to be reckoned with. 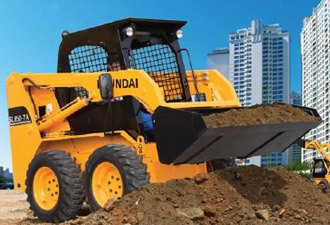 As Hyundai dealers we have seen Hyundai use its experience in car manufacture, ship building and industrial equipment manufacture to develop construction machinery that is designed to be effective in terms of ergonomics, reliability and fuel efficiency. 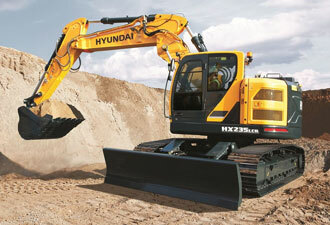 Hyundai’s philosophy is that better designed machinery results in a better job done – as well as happier operators. So, as well as improving the strength and performance of their machinery, Hyundai also put great emphasis on ease of use and operator comfort. Heavy duty earthmoving equipment with caterpillar tracks. The Hyundai HX Series is substantial, with 14 models to choose from, meaning finding the right size and power for your task is easy. The HX ranges from 116hp to 424hp and a weight range 14,535 kg to 53,680 kg. Earthmoving equipment with wheels is ideal for smaller sites where manoeuvrability is important. 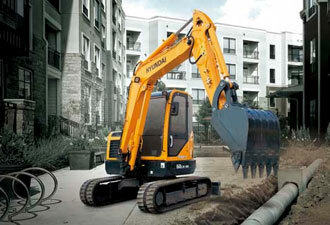 The HW Wheeled Excavators range from 157hp tp 183hp with a weight range of 13,880 kg to 21,200 kg. Ideal for smaller tasks or where you need to work in a relatively confined space, Hyundai’s mini and midi excavators are the perfect choice. With 7 caterpillar track models to choose from, they can handle from 1.6 to 8.2 tonnes, with power ranging between 17hp and 61hp. All models feature a fully enclosed operator cab for comfort and extended operating time. For moving heavy loads from one location to another, wheel loaders offer full cab comfort and visibility combined with exceptional hydraulic power. 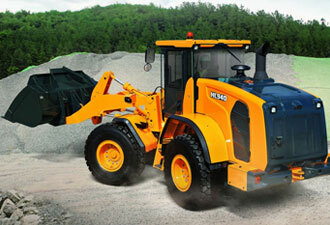 The HP Wheel Loaders range from 158hp to 380hp with a weight range of 13,100 kg to 31,000 kg. When you’re working in a tight space and need to turn on a sixpence, a skid steer loader is the ideal choice. 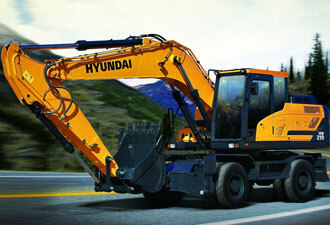 Hyundai offers 2 models with lifting capabilities of 2.7 tonnes (48hp) or 3.3 tonnes (75hp). However, the smaller range of models belies the sheer versatility of these machines. With an extensive range of attachments, these machines can be excavating today and moving pallets or farm loads tomorrow. Hyundai construction machinery is available at Ernest Doe Power stores in Surrey, Kent, East Sussex, West Sussex, Essex, Suffolk and Norfolk.